Our first day of birding in Texas was spent in San Antonio and Corpus Christi. Toward the end of the day, after deciding that we had enough time to drive from Corpus Christi to Aransas National Wildlife Refuge with some light left to look for birds, we headed north to the refuge. On our way, we realized we wouldn't have nearly as much time as we thought we were going to have. A Townsend's Warbler had been spending most of the winter by the visitor center, so that is where we stopped with only about 45 minutes left until sunset. We started off by looking in the trees across the road from the visitor center, but all we found were mosquitoes. I decided to go look in the trees across the parking lot. The first thing I saw was an Armadillo. I then heard some gnatcatchers and went to find what I hoped would be a flock. Within a couple minutes, the Townsend's Warbler had popped out and foraged at eye level for a couple minutes. Before arriving in Corpus Christi and Aransas, we started the day in San Antonio at Crownridge Canyon Natural Area. Before getting to the park, we were able to see our first Spotted Towhee, Black-crested Titmouse, and Yellow-rumped Warbler. We also found our only Harris's Sparrow of the trip. All of these birds were seen from the drive thru of McDonald's of all places. Our target bird at the park was Golden-cheeked Warbler; unfortunately we were only able to hear it singing a few times before it moved up the hillside. 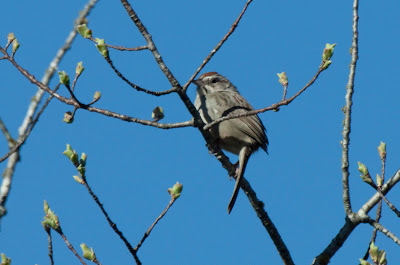 We did find a couple singing Rufous-crowned Sparrows, which were life birds for Rob. From San Antonio, we started heading southeast towards Corpus Christi. On the way, we planned to look for Northern Wheatear (only the second accepted record in Texas) and a Northern Jacana. Northern Jacana once it had flown across the lake. Our first stop was at Choke Canyon State Park. As soon as we got out of the car, we started seeing a few of the Texas specialties, including Golden-fronted Woodpecker, Cave Swallow, Long-billed Thrasher, and Olive Sparrow. 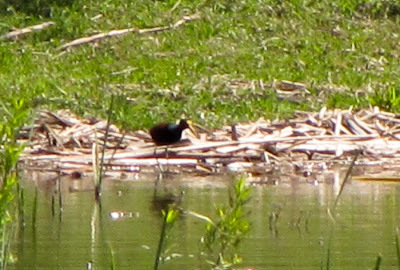 We walked up on to the dike and quickly found the Northern Jacana on the edge of the lake. The Jacana then flew across the lake and foraged in the reeds for the rest of the time we were there. After just a 20 minute drive, we arrived at the Northern Wheatear spot. This wheatear has spent a few months on a small farm in Beeville. Luckily, the owner of the farm (John Borntrager) is a birder and allows people to come on to his farm to see the bird. We scanned the farm for only a few minutes before the wheatear showed up, and we watched it for the next 10 minutes as it foraged and flew around the farm. Then, we drove on to Corpus Christi and Aransas National Wildlife Refuge. The number and diversity of hawks was really impressive. 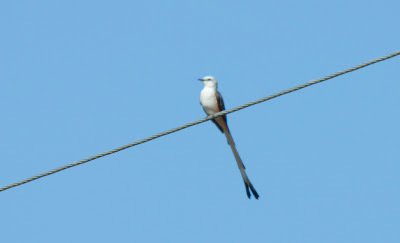 We had White-tailed, Harris's, Crested Caracara, and White-tailed Kite among a few others. 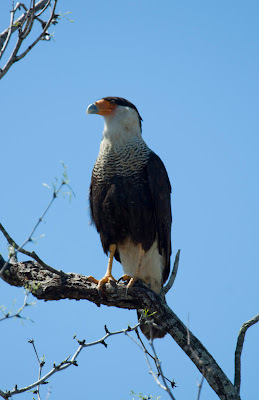 Crested Caracara-One of the most common raptors in Texas. Wow. Did you do all that in just one day. Northern Wheatear must be an extremely unusual bird in the US? You guys had incredible luck! Reading your posts, so many fantastic birds are preceeded by "we quickly found the..." "we only looked a few minutes before we saw the..." Nice job! Jacana and Wheatear are amazing birds!